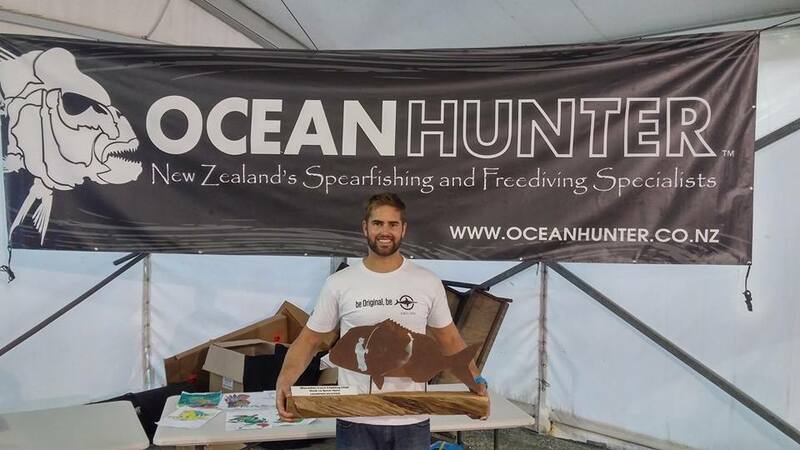 Moss partnered up with fellow spear fisherman Rowan Virbickas for New Zealand Spearfishing Nationals. They placed 5th in the competition and made the NZ team for the Inter Pacific Champs taking place later in 2016. This is Moss's 4th sport representing NZ! Moss won the Hook vs Spear competition with a 20.33 pound snapper (9.22kg). With Moss's recent freediving focus he wanted to find out if he is the world's deepest Olympian and had heard of Trinidad's, George Bovell ﻿and his impressive freediving & spearfishing abilities. 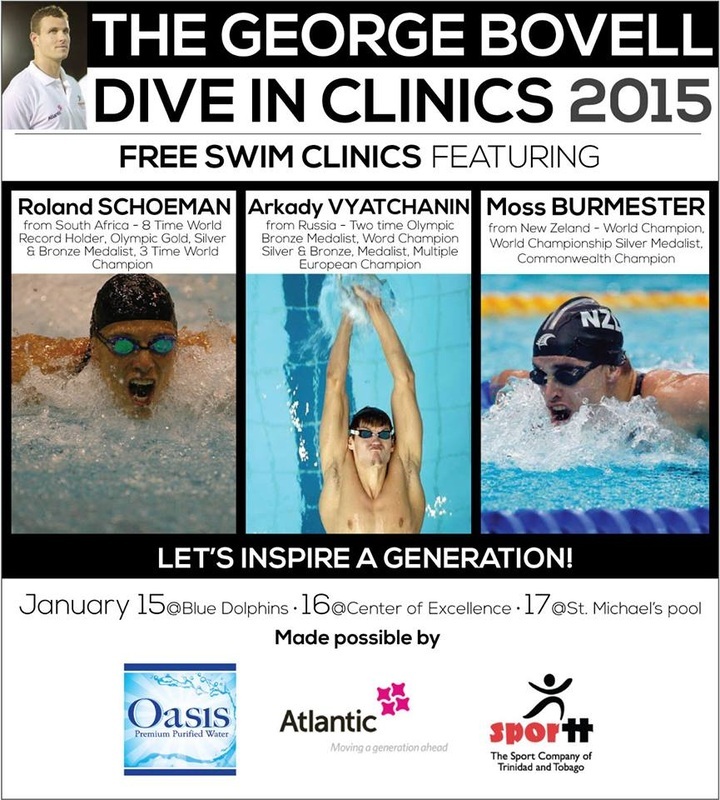 Timing was prefect as George was preparing to give back to the local community by running his free Dive In Clinics and invited Moss to be one of the coaches, along side﻿ Roland Shoeman and Arkady Vyatchanin. Moss jumped at the opportunity to help inspire Trinidad's future swimmers and kids similar to the way he has been doing with the NZ Olympic Committees - Olympic Ambassador Program. George may also have dangled the fish hook of taking Moss out spearfishing which Moss took hook, line, & sinker! After catching up with Jonathan Sunnex earlier in the year in Turkey, and proving his freediving capabilities, Moss was invited to be part of the Vertical Blue safety team at Dean's Blue Hole in the Bahamas. The event consisted of 35 competitors and 7 days of competition. On the 5th day of the competition, Moss was honoured to be selected as Will Trubridge's second safety diver during his 102m CNF (Constant weight without fins) World Record attempt. The Fort Lauderdale Swimming Hall of Fame is legendary in the realms of the swimming world. Through mutual friends Moss was put in touch with Masters head coach Marty Hendrick and asked to teach and impart some of his knowledge to both the masters and youngsters on their Saturday morning session... Marty even managed to get Moss in the water to show them a few lengths of butterfly! Barcelona is a great city and the 1992 Olympics really did help it emerge and prosper into what it is today. The pool is atop of a hill and famous for its TV shots of the divers with the city and sea in the background, it also was where Danyon Loader won his first ever Olympic medal , a silver in the 200 Fly. Even though the entry was super expensive and the pool freezing, it was an opportunity Moss couldn't miss and decided to brave the elements to grind out a few lengths so he could claim he swam in Loader's medal winning lane. 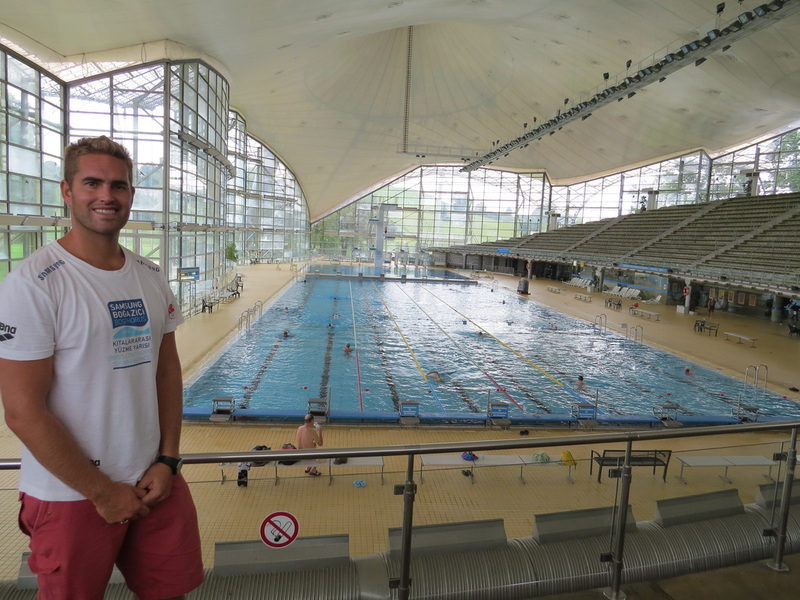 While visiting Munich in Germany, Moss took the opportunity to visit the location of the 1972 Olympics and jumped in for a dip. The pool is located within Olympia Park and has a lot of history. It is the place where Mark Spitz won seven Olympic Gold medals in seven world records! While travelling around Europe, Moss took the opportunity to participate in the iconic Bosphorus strait swim from Asia to Europe in Istanbul, Turkey. It was a 6.5km swim and he placed 1st in his age group, and 10th overall with a time of 48.52. After speaking with Kimberlee Downs from One News at a recent event, a sport story was recorded of Moss's more recent water interests. As of Monday May 5th, he has now joined the 145 club at Auckland Freediving Club. This requires the members to swim 100 metres underwater in a pool, 40m free dive (downwards) and have a 5 minute static breath hold! 30 children aged﻿﻿ 8-10 ﻿﻿attended the Jet Star Super Swim Squad event along with Moss Burmester, Melissa Ingram & Rick Wells at Auckland's Tepid Baths. 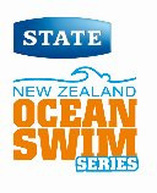 The children were winners of their age group in each of the five State Ocean Kids around NZ and had a lot of fun learning new skills, racing the athletes and competing against their parents in a relay! 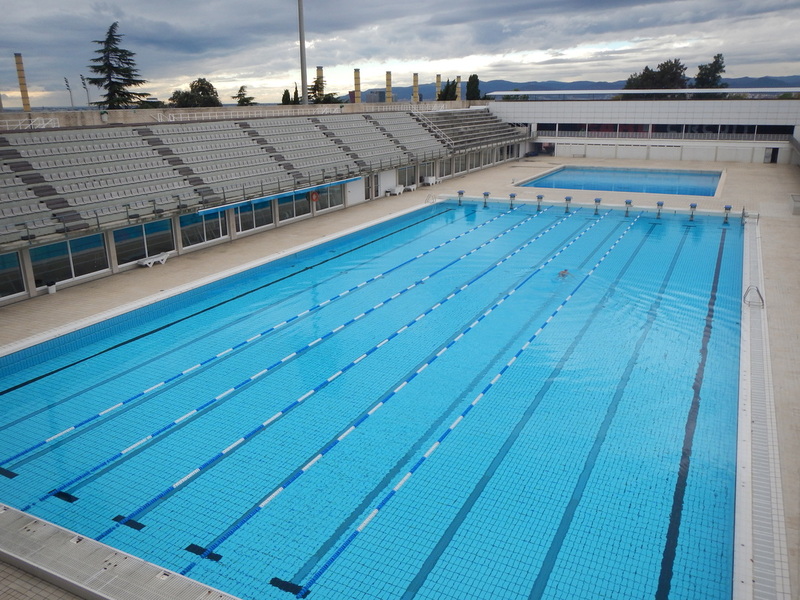 Moss was approached by Pitch Perfect Promotions NZ to act and swim for a Sony underwater MP3 shoot filmed at Northern Arena. Starting at 8pm and ending some time around 2am, it was a big day having been in Matamata earlier to speak to two schools. The footage from the shoot will be used for the Cannes Lions advertising awards taking place later this year. As an Olympic Ambassador, Moss was invited to present to two schools in the region - St Josephs Catholic School and Matamata Primary. As an Olympic Ambassador, Moss was invited to present to four schools in the region. Motupipi School, Golden Bay High School, St Joseph's School and Clifton Terrace School. To the students amazement, Moss along with their teachers at one school, stripped down to their speedo's in a fun two team race! 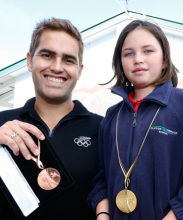 As an Olympic Ambassador, Moss was invited to present to Whangamata Area School. While in Whangamata he also had a lot of fun teaching a few lucky students some swimming techniques, which according to one father, were put into practice at the Waikato Classic. "Most of them shaved at least 5 seconds off their times at the meet". 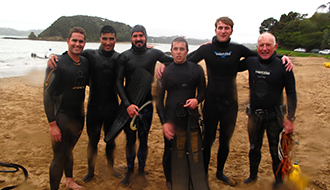 Moss undertook the challenge of this years National Spearfishing championships in New Zealand's very own Bay of Islands. Between Moss and his spearfishing buddy, Nat Davey, they won 3 top three finishes and Moss won super diver. Thanks to a little nudge of encouragement from State's very own Scott Rice, Moss undertook the 2013 State Harbour Crossing. This year Moss left his kick board and snorkel behind, and did not continue his 'no arms' tradition. Instead he chose to swim as a 'normal' competitor, along with his mum and brother. As an an Olympic Ambassador, Moss was invited to present to Stanley Avenue Schools junior school (year 0-3) and senior school (year 4-8). He spoke to them about the values and absolute importance of setting goals and also had an interview with the schools SAS TV group. Moss was invited to attend the Prime Minister's Olympic Gala Dinner that took place at the Pullman Hotel in Auckland on Thursday the 17th of October. The dinner was an extraordinary opportunity to interact with the nation’s powerbrokers including Cabinet Ministers, New Zealand’s highest profile CEO’s and some of New Zealand's best-known athletes. Moss spoke at the opening ceremony of the NZSS Underwater Hockey Championships in Auckland. Ferne, a young relative from Tatuanui Primary School contacted Moss requesting him to speak to her school. Fortunately, a school tip to Auckland enabled Moss to present to them at Long Bay's Sir Peter Blake Marine Education Center. It was a great evening thanks to the wonderful welcoming performance and entertaining songs about Olympia - a special thanks to Robyn and Ferne. Moss accepted the challenge of joining the Wettie spearfishing team "Wettie Young Guns" to compete in a 4km snorkel scuba race (with fins & towing a duck decoy) from Russell to Paihia. The race was part of the local fire brigade fundraising event. Early in the day there was also the "big 3" team competition. This included catching and weighing the biggest crayfish, kingfish & snapper caught. Everything caught was then auctioned off to raise funds for the fire brigade. Unfortunately the weather was not beautiful but Wettie Young Guns still put their practice and competitiveness to good use coming first this year! Moss was invited to be part of the Sir Peter Blake Dream Team during Leadership week. 200 volunteers, 200 classrooms & 6000 kiwi kids were involved in this initiative - with the aim "Dare Dream Do" - getting kids to dare to dream big and work towards achieving it! Leading up to the King of the Bays event, Moss undertook a suprise swim lesson with the Manurewa swim school kids, passing on a few last minute tricks and tips. The swim on the day was a complete success! Being the new Rosie the dog benchmarck, Moss completed the events 10th anniversary by kicking the entire 2.8km without the use of his arms. 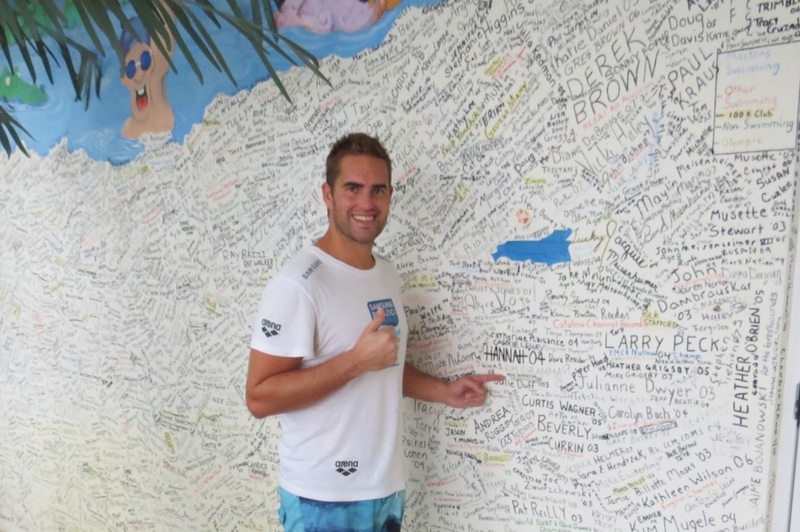 He completed the swim within 53:57, a great benchmark for everyone competing in the King of the Bays. Moss also kicked the Harbour Crossing in December 2012 to raise funds for mental health. Moss was invited by Scott Rice (from State Ocean Swim Series) to undertake a surprise coaching swim session with the eager kids from Manurewa. The children were provided with free entry to compete in the the State Kings of the Bays the following weekend and were very excited to be coached by Moss let alone get on the news. 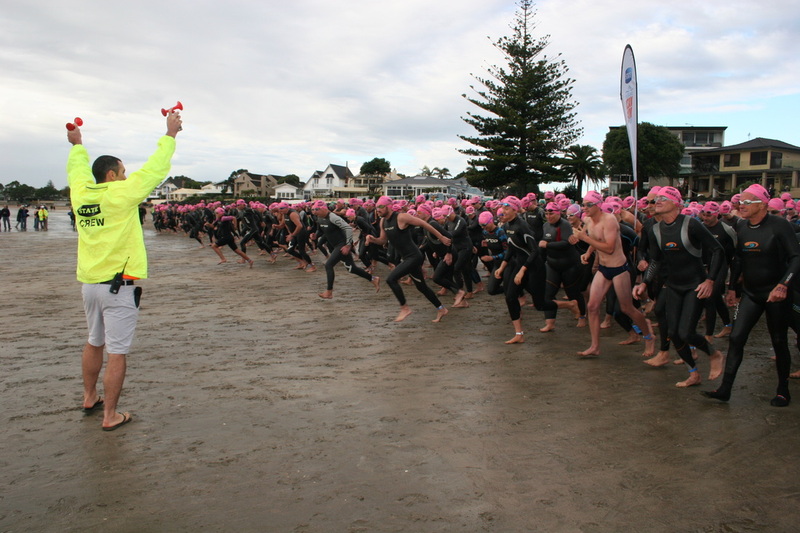 To help raise awareness for 'Good Sports for Cure Kids' 2013 campaign, Moss competed in a swimming race against Guy Williams and Eva (an 11 year old girl). Being good natured and full of plenty of laughs, Guy Williams was successfully first into the pool and last out. Eva was second in the pool, with a very close run for first place with Moss who started last with the longest delay. Volunteering as athelete support for the Australian Youth Olympic Festival, Moss was able to meet and help the up and coming New Zealand Olympians. To help raise funds and awareness for mental health, Moss took on the the Auckland Harbour Crossing from a new perspective. Without the use of his arms, Moss swam the 2.9km distance from Quinton Park to Auckland's Viaduct Harbour. With the help of a snorkel and two kickboard's taped together, Moss successfully kicked the entire distance. North Shore Swimming club took on the challenge of beating the previous record of 30 minutes 18 seconds for 100 people to each swim a 25m length. With Moss taking the start and multiple other brilliant swimmers all doing their part, the record was easily broken creating a new mark of 21 minutes 22 seconds.